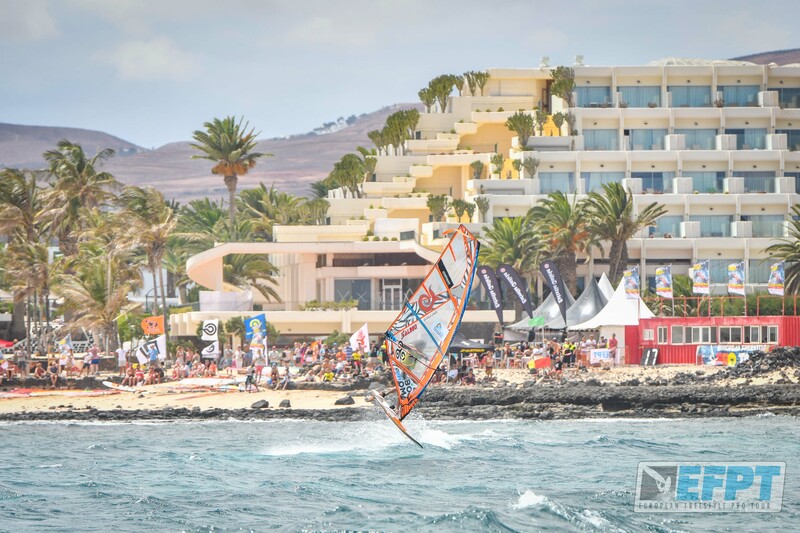 Since four years now, the best freestyle windsurfers of the world have been travelling to the Canaries to compete in what is known to be one of the best freestyle windsurfing events ever. The strong trade summer winds of the Canaries and the spot here at Costa Teguise, with the outside reef, used to provide a perfect playground year by year. 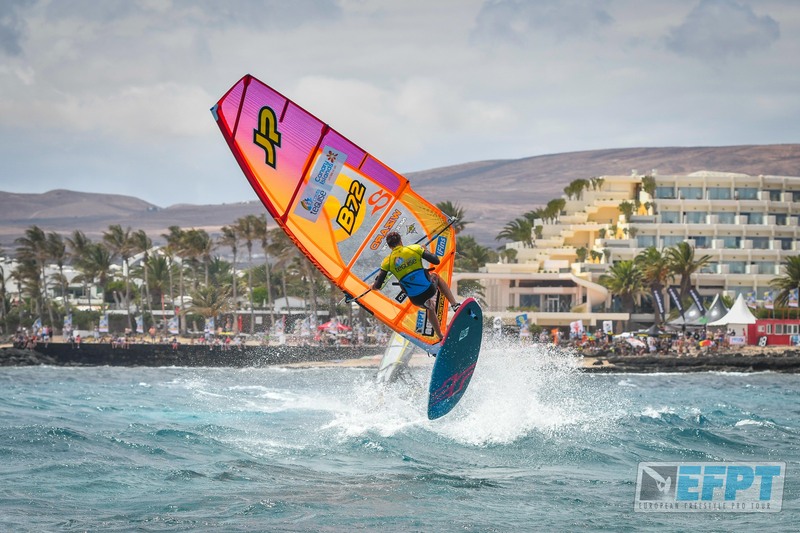 At the 4th edition of the EFPT Lanzarote, 27 riders from 14 different nations registered to battle for the 10.000€ prize-money and valuable points for the annual overall ranking of the tour. Going into the race as contenders for the title this year, were Sam Esteve (JP/Neilpryde) from France, currently ranked 2nd overall and Jacopo Testa (RRD/RRD) from Itlay who leads the tour after the first two events. 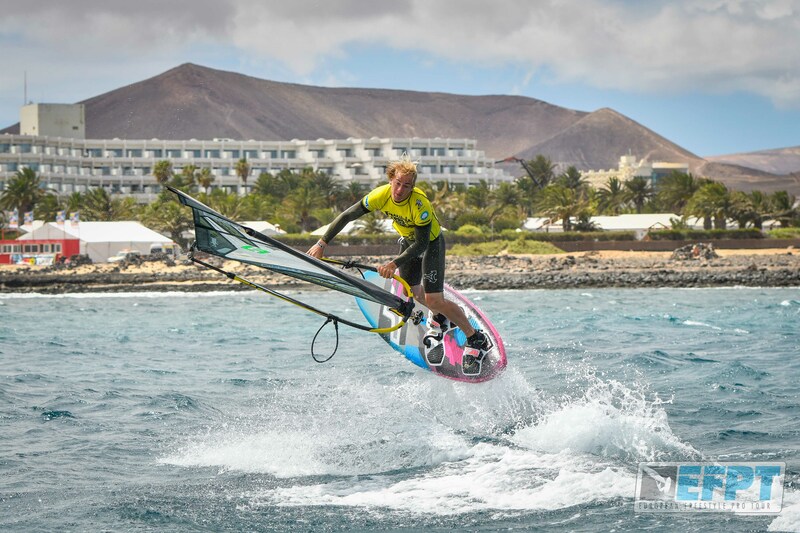 Former multiple European Champion and World Champion Steven Van Broeckhoven (JP/Neilpryde) entered the competition as eager to win the event as JP team-mate Yentel Caers and Tonky Frans (RRD/RRD), who calls Las Cucharas his homespot. Some other well known faces on the list are Adrian Beholz (Sailloft/Patrik), Marco Lufen (North/Fanatic), Rick Jendrusch (Severne/JP) and Riccardo Marca (North/Fanatic) just to name a few. Apart from the experienced freestylers, we were also happy to welcome the EFPT rookie and talent from Poland Maksymilian Lesniewski (Patrik), as well as the youngest rider of the tour, 13 years old Lennart Neubauer (Starboard/Neilpryde) from Greece. Shortly before 1.00pm, the first heat was launched with seven minutes duration and three moves counting each tack. The riders picked their 4.5s – 5.2s and put on quite a show already in the first few heats. Andy Lachauer (JP/Neilpryde) from Germany, who already convinced in Austria with a very decent performance, sailed some solid heats against Jeremy Plüss from Switzerland and Riccardo Marca from Italy. With funnell-clocks, shakas, burners, culos, skopus and konos he manages to kick out Plüss, yet had to let Marca pass through to the next round. Max Matissek, North/Fanatic teamrider from Austria, sticked some nice tricks in his heats including shove-it cheeserolls, skopus, shove-it spocks and power moves, which let him advance over Eilon Wilson (Patrik) from Israel, but wasn’t enough to go past Yentel Caers in the next round. Julien Wiemar (Severne/Starboard) definitely deserves a mention here, as the yound German freestyler managed to first beat Severne team-mate Rick Jendrusch from Holland and could then take out currently ranked 8th in the EFPT Davy Scheffers. Wiemar was sticking some super clean culos, funnell combinations and shakas, but eventually had to let Caers pass on to the next round in the quater final. As the competition went along, we’ve seen some very close decision, one of them between Giovanni Passani from Italy against Maarten Van Ochten (JP/Neilpryde) from Holland. The Dutch sailor, who struggled with a knee injury over the past weeks, could win on diversity and technical difficulty, whilst Passani took the style points. However, the decision did favor the Dutchie in the end and set Passanis whole focus on the upcoming double elimination. 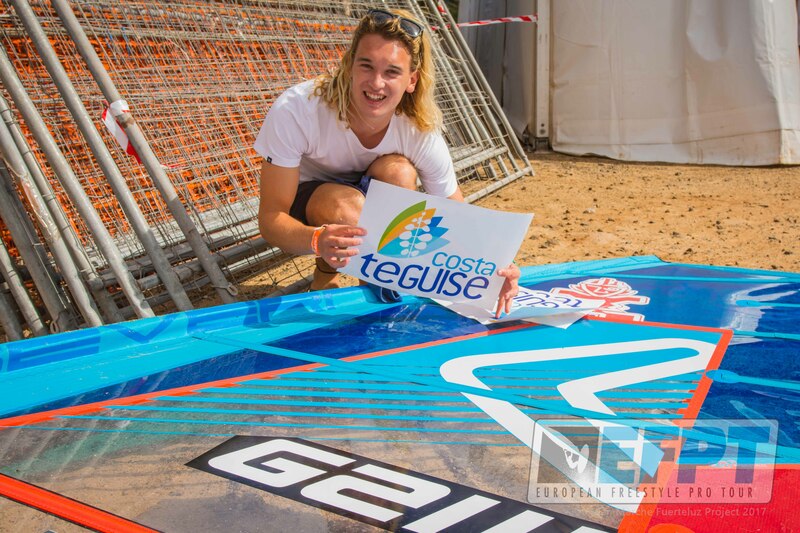 Sam Esteve is definitely one of the European guys to watch out to when it comes to the top positions in freestyle windsurfing. The Frenchie, who dominated his heats in the Toro Andaluz earlier this year, landed nice shove-it spocks, air funnell into burners and burners one handed just to mark down a few of the technical maneuvres by the talented young-gun. Esteve took out Adrian Beholz (Sailloft/Patrik) and Riccardo Marca and once again the Belgian rider Yentel Caers was the one to stop his run through in the quater final. In the losers final Esteve then met Jacopo Testa, who first won over his RRD team-mates Francesco Cappuzzo and Tonky Frans, to then face Steven Van Broeckhoven who was a force of his own. Jacopo Testa on his side went for spock culos, spock konos, regular chachoos, kabikuchis both tacks, bonkas and culo spocks in all of his heats, proving that he could perform on a high level in all kind of conditions. The Italian rider took a well deserved third place after the single elimination. In the winners final Yentel Caers met Steven Van Broeckhoven. The highly skilled JP/Neilpryde rider was rotating through his double moves with a lot of power and was putting together some very stylish, diverse and technical difficult heats. His repertoire today consisted of beautiful paskos, air funnell into burners, double culos, kabikuchis, shifties, bonkas, double burners and no handed burners. Caers himself was answering with moves of his own like a pasko, a one handed culo, a shove-it spock 540 and an airchachoo to count on port tack and a kono, culo360, double culo and skopu to count on starboard tack. However the Belgian battle favored the more experienced rider Steven Van Broeckhoven in the end and made him the winner of the first single elimination. As the wind seemed to get more and more stable throughout the day, the double elimination has been kicked off directly after the final, with several riders wearing some war paint, eager to fight their way back up in the ranking. One of those riders has been Francesco Cappuzzo, who tried to climb back up by taking down Plüss and Van Ochten, to then be stopped by Riccardo Marca. Even though the RRD rider managed to win on style, Marca conviced the judges with a double culo on starboard, a kabi, konos both tacks, a ponch, an air funnell, a shaka as well as a culo on porttack. Another member of team Italy, Giovanni Passani, was highly motivated and dominated over Beholz, Lachauer and Tonky Frans, proving all of his potential by landing shitfties, paskos, konos and culos on both tacks as well as air funnell and burner combinations. Max Matissek from Austria showed a decent performance in the double elimination and was advancing over Neubauer and Yagen to then get stopped by the New Caledonian rider Antoine Albert (Goya/Goya) in a very close heat. Matissek was putting together great heats, landing paskos, shakas, burners and culos, as well as skopus, forwards and ponches. As we got later and later into the first day of competition, the tide at the spot increased more and more and so did the wind. This led to the decision of postponing the last heat of today, with Marca facing Wiemar and Albert facing Passani, to tomorrow morning. The forecast looks promising for the whole day and we are looking forwards to an exciting remaining double elimination and the second single elimination! Skippers meeting is schedulded for 9.30 am, first possible start 10.00am!